We are huge fans of Julia Donaldson's books in this house! Minnie's favourite character though has to be the Gruffalo! We read this nearly every night (I say we read, I used to read it to Minnie, but now she can recall most of the story & reads it to me!) She loves to act out the story at home, & has perfected a rather impressive Gruffalo roar!! 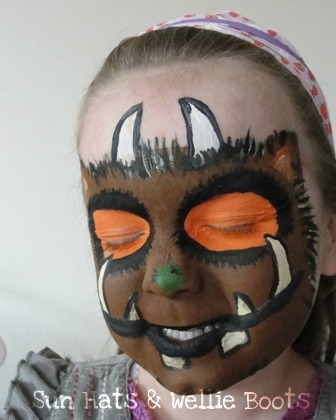 As I was sorting out my face-paints yesterday Minnie asked if she could have her face painted as a Gruffalo! Eeek! 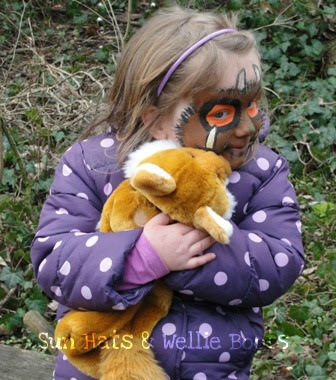 I came up with this Gruffalo-ish face, & her next request was to go outside & be a Gruffalo! 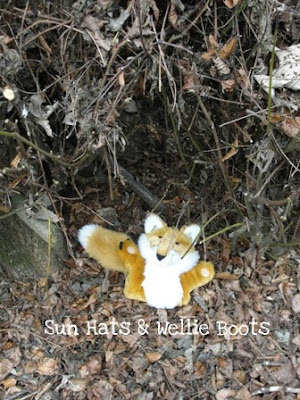 As she grabbed her wellies, I collected her toy owl, snake, & fox puppet, & we headed for the door. Just before we stepped out she popped back to collect more toys & then off we set. We're really fortunate to have a wooded area near us & love exploring it throughout the year. However, today was the first time that I'd been accompanied by a Gruffalo, & it was so funny to see peoples reactions to Minnie as she strolled along beside me! 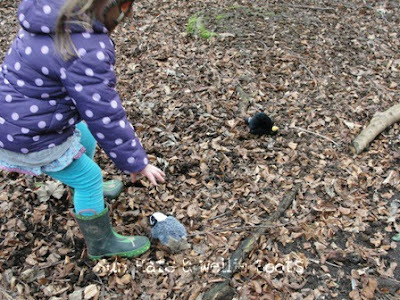 As we walked along a small path in the wood we left a trail of toy animals hidden en route so that we could find them when we followed the trail later. 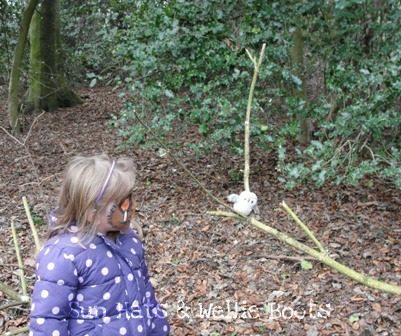 When they were all hidden we walked along the path again, this time with Minnie acting out the story of The Gruffalo! She started the trail pretending to be the mouse from the story & was so excited to find the fox we'd left earlier! 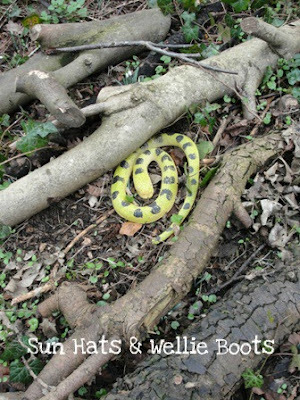 Soon snake was discovered, along with a toy badger, 2 toy birds & Pudsey bear!! (Minnie had added these earlier!) Then it was time for Minnie to became the Gruffalo & she retraced her steps back along the path. This was such a great way to recall & explore a familiar story, the individual characters, & various emotions. Playing a character enabled Minnie to step inside the narrative & push the story in different directions creating new scenarios & possibilities. The great thing about this activity is that children can explore the story in a way which is relevant to them. 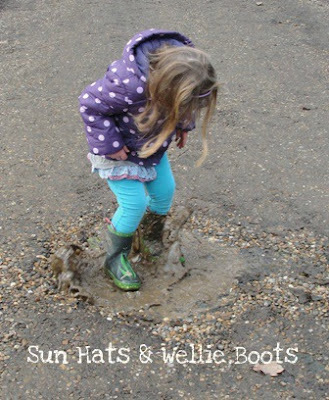 As we headed home we discovered that even a Gruffalo enjoys jumping in muddy puddles too! 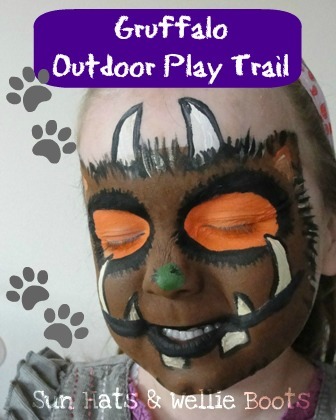 If you fancy making a Gruffalo trail like this one, why not print off pictures of the animals from the story, or invite children to draw them, & place them around the garden, or house. 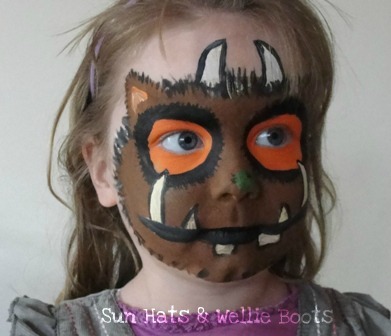 If your child doesn't enjoy having their face painted, how about making your own Gruffalo mask (or you could use the template here).